The Philippines' Department of National Defense (DND) and the Philippine Navy (PN) has selected Indonesian state-owned shipbuilder PT PAL (Persero) to build 2 Landing Platform Docks (also known as the Strategic Sealift Vessels or SSV). PT PAL's executives confirmed that they already received the Notice of Award as of 1st week of January, and MaxDefense sources also confirmed that the NOA was indeed given as early as after the New Year holidays. The Indonesian Navy's Banjarmasin-class LPD from PT PAL, which has slight differences from the original Makassar-class made by Daesun Shipbuilding. 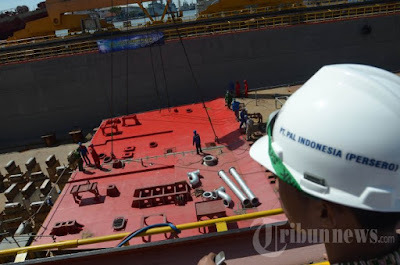 It was also known and confirmed recently that a contract was already signed between PT PAL and the DND/PN as of the end of January 2014, thus finalizing the start of construction of the 2 ships for the PN. It is expected that the first ship will be delivered to the PN within 2 years, or by around February 2016, with the second ship delivered by around February 2017. PT PAL and Philippine Navy officials during the contract signing at Philippine Navy Headquarters. Photo taken from PT PAL website and Indo Defense blog. 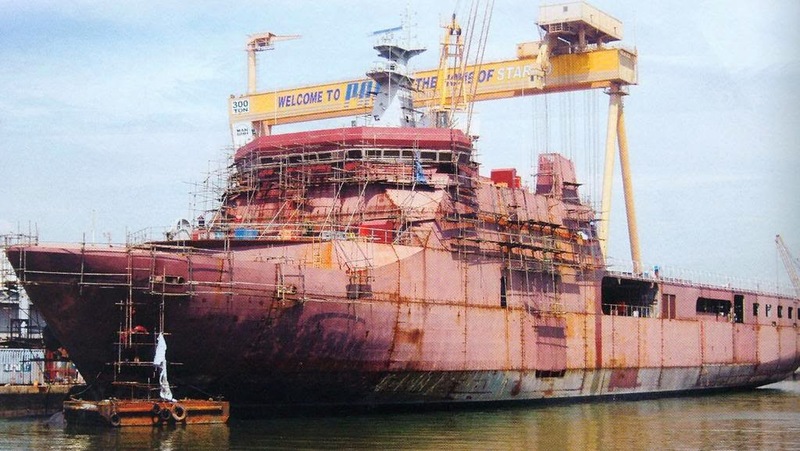 For those who are unaware of the project, the Indonesian shipbuilder was the lone eligible bidder out of 2 entities that joined the tender last August 2013, the other being Daewoo/Daesun Shipbuilding from South Korea, whose bid was declared ineligible. PT PAL's bid for the project was Php 3,863,999,520, a little lower than the Php 4 billion ABC for the project. PT PAL will be using a derivative of their Banjarmasin-class LPD, which itself was derived from the Makassar-class LPD made by Daewoo/Daesun Shipbuilding for the Indonesian Navy (TNI-AL). Upon winning the tender, PT PAL underwent a post-bid qualification, which include site inspections and checking the declared capability of the shipbuilder. 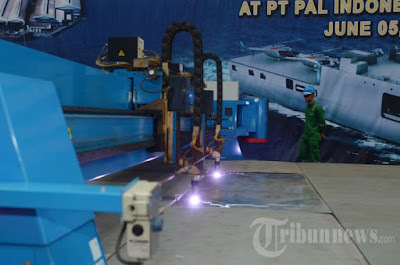 As expected, PT PAL passed the requirements due to its previous experience in building similar vessels, and its growing capability to construct more complex naval vessels, which includes the local construction of sections and completing the Indonesian Navy's PKR (Perusak Kawal Rudal) frigate based on the Dutch SIGMA 10514 design. Construction of Banjarmasin-class LPD at PT PAL shipbuilding yard in Indonesia. The specifications of the LPD (SSV) was discussed in previous MaxDefense blogs, which can be found on the link HERE. From now on, MaxDefense updates on this project would probably be regarding the construction phase of both ships, and on the separate systems which include weapons and sensors system. 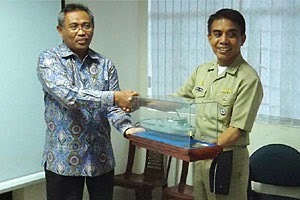 PT PAL confirmed that they have signed the contract last June to build 2 SSVs for the Philippine Navy for $92 million. This amount includes the integrated logistics support (ILS) for the ships. It was reported earlier in local media sources that the ships will not include weapons and sophisticated sensors systems aside from the commercial-spec'd navigational radar. 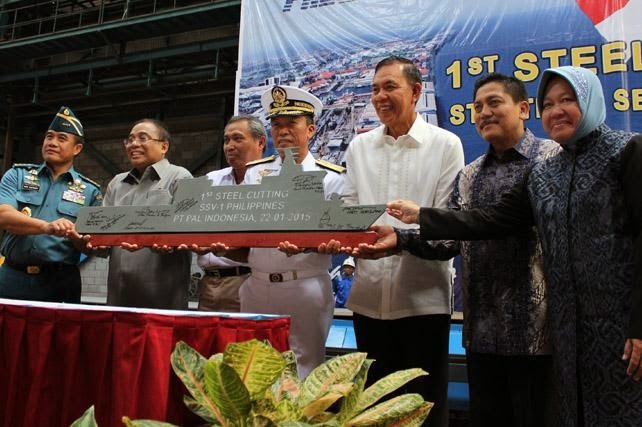 The steel cutting ceremony was held for the first Strategic Sealift Vessel of the Philippine Navy at PT PAL's facility in Surabaya, Indonesia. Temporarily named "SSV-1", the first of the class appears to still be unnamed as of this writing. Philippine Navy FOIC VAdm. Jesus C. Millan was present during the ceremonies. 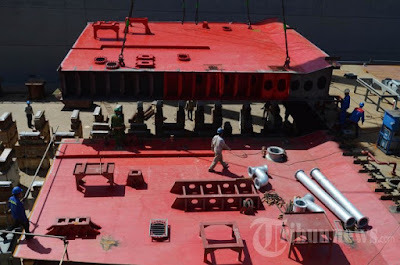 Reports coming from Indonesian media places the length of the ship at 123 meters, and a width of 21.8 meters, has a crew of 121 men and can accommodate 500 troops. It is also said to use steel materials supplied by Indonesian company PT Krakatau Steel. Although unconfirmed, this might be the closest scale model of the Philippine Navy's SSV. 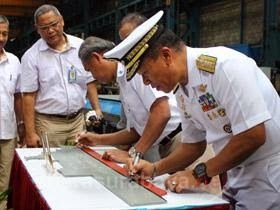 It shows helicopter landing space for 2 helicopters, and a main gun that looks like an Oto Melara 76mm SR.
Officials from the DND, PN, Indonesian Government, Indonesian Navy, and PT PAL with the signed plate in the shape of the PN's SSV. A construction milestone has been reached for both Strategic Sealift Vessels by PT PAL on June 5, 2015. For the SSV-1, PT PAL declared that it has entered the keel laying stage of the work, which accounts to around 25% of the work, while they also announced that at least 80% of all imported parts are already delivered to their facility. PT PAL expects to launch the ship by November 2015, and reach its deadline to deliver the ship to the Philippine Navy by May 2015. For the SSV-2, a 1st steel cutting ceremony was also made, in a similar fashion as that of the first ship. 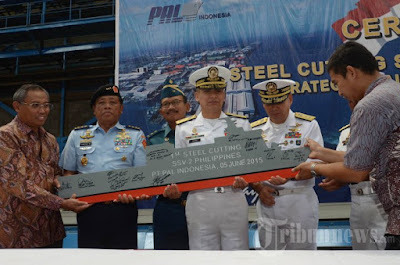 Photos during the 1st Steel Cutting ceremonies for SSV-2, with RAdm. Cesar Taccad representing the Philippine Navy. 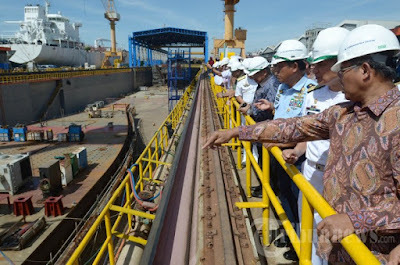 PT PAL, Indonesian governement and Philippine Navy officials view the keel laying works on the first ship of the class, temporarily named SSV-1 last June 5, 2015. Sir Max, off-topic. Ano iyung sinasabi ni Tulfo sa article niya kahapon about the multi-purpose attack craft ng Philippine Navy na hindi na gumagana after spending 270 million pesos ng buwis natin; mauy alam po ba kayo tungkol dito? Still verifying that claim by Mr. Tulfo. From my understanding, the boats regularly undergo scheduled maintenance, but not according to what he claims. I hope this is not a.proto type what the Indonesia had? As I have read the technical specs is that fitted for but not.with for the combat systems. Usually the problem occurs on this is the stability, power and cooling system of the ship. I hope this was studied very well because it was a lesson learned from british air craft carrier when the british want an heavier weapon systems that resulted to additional displacement of the carrier wherein they considered the buoyancy of the platform on the effect of high sea state in an open sea. Sir Max, can this ships conduct defensive purposes like Anti-Submarine warfare since they could carry 5 helicopters? Although LPDs aren't usually used for Anti-Sub warfare, I would say yes because it can accommodate 10-ton helicopters. The helos must be anti-sub capable (carrying torpedoes, sonar, etc). in theory it can. in reality its not cost effective. Helicopters has limitation in endurance , weapon and sensor payload. ASW helicopter just complement other ASW platform such as surface ship, aircraft and attack submarine. Anti-Submarine entails more than just having ASW Helicopters on board. Ideally the ship should be equipped with its own sonar (preferably a towed sonar array) to at least get a general bearing on a possible sub contact before sending out ASW Helos for a more precise fix. ASW Helos cannot just fly 24/7 using its MAD or dipping sonar to look for subs. ^, I think if it is a derivative of the Banjarsamin Class LDP built by PT PAL, it could carry up to 5 helicopters, 4 on the top and 1 on the hangar.. The Makassar Class could only carry 3( 2 heli's on flight deck and 1 on hangar),..Banjarsamin Class, has a Flight deck that is bigger than the Makassar Class but the Main superstructure is adjusted to become smaller than the Makassar Class..
Hi Mr. Allen, If that is your iterpretation that the SSV will have a 5 10 ton class helicopter capacity landing pad and contrarty to this...here is my question, How will the PN accomodate a 500 troop requirement on a 30days endurance at sea when the superstructure of the ship will be shorter and tied to 344troops if you will have a longer landing platform? My point is at 2 helicopters on pad and 1 on hangar, we will have a longer superstructure and materialwise its a plus factor to the purchase...unless you will setup some temporary tents on the pads to house your troops at the expense of the area for the helis? Allen, answers are both right and wrong. The Makassar-class is a proprietary design of Daesun Shipbuilding. 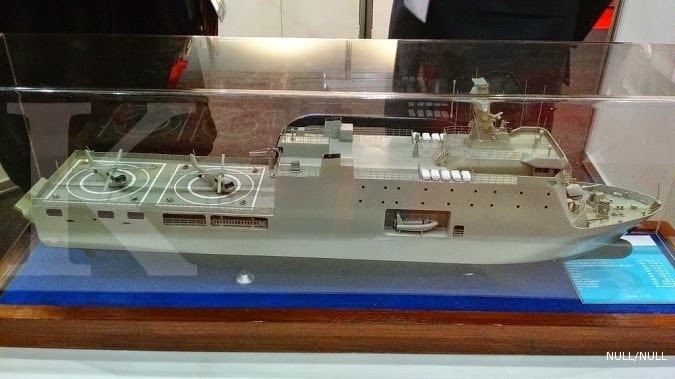 So PT PAL has no choice but to use the Banjarsamin-class design, but it will reduce the flight deck size to enlarge the superstructure for more cabin accommodation as the original Banjarsamin-class design can accommodate less troops than what the PN required. This will make the ship more similar in appearance to the Makassar-class but not necessarily same. Sir, how about the Radar and Weapons System? Is it supplied by PT PAL or the PN will be the one installing it? oh and Happy Valentines to all..
Sir Max, what's Notice of Award and Letter of Credit? are they same? A Notice of Award basically tells a company that their bid has been selected as the winner. Congratulations! There are no unused W-3A Sokols. Are are heavily used with the PAF's 505th SARG. But these helicopters can be used to land on the SSV when needed, as the PAF are being constantly trained to interoperate with the PN, including landing and take-off of PAF helicopters from PN ships. Sir Max that's a good move of our AFP for the two services interoperability...yes the very sound for coordinated operations. the PN continues to surprise me! not only one but two! these two ships will be like our version of the dokdo class helicopter carriers of korea and hyuga class of japan. we are truly becoming a blue water navy. PN should buy an additional 2 units SSVs, to have a total 4 units. We need these ships for quick, battalion-level military deployments and for response to natural calamities. Also, maybe by 2020's we can buy a bigger AAV. Additionally, PN should buy 2-3 medium-weight choppers as complement for each of these SSVs. yup thats a howitzer but temporary only for photo op. Hope this year will be a good news to our Nation, please read this, sana matuloy na ang FA-50..
Sayang lang ang pera dyan. Sa perang yan, na upgrade na sana lahat ng PN cargo ships (LST, LSV, LCM etc) ng mga Philippine shipyards. Kumita pa sana ang ekonomiya ng Pilipinas. Kung gerra na, anong ginagawa ang sangdamukal na commercial RoRo ships natin. Hindi ko alam kung ang mga DND AFP PN officials ay gusto talagang palakasin ang ating depensa o hanggang kailan ay kolonya ng iba. Papeteks peteks lang at laging umaasa sa US. Di naman po sayang pera dumaan yan sa tamang proseso ng bidding at pinag aralan yan ng AFP-DND before they go for it. as for RoRo i dont think na pwede sya for Military use due to its lack of facilities at di sya made for Military Specs. Rubbish. The need for MRVs (or SSVs or whatever you call it) are clear. The Philippine Navy's Strategic Sail Plan 2020 laid it out. They are the one who crafted the bid specifications. Do you even know anything about the specifications or are you just regurgitating hearsay about RoRo? Upgrade? The LSTs date back from World War 2. How long do you want to keep them? The SSVs will partially relieve them from use, preserving their use for when it counts. Philippine shipyards were invited to bid. They did not. How do you expect Philippine shipyards to get the contract when they did not bid? The SSV program is actually the first step in achieving credible defense. In fact, Strategic Sail Plan 2020 determined that the PN needs 3 of them, so the 2 currently ordered is actually not enough. Sir, upgrading our LST, LSV and LCM is too expensive due to most of these ships are WW2 era pa. And even the RORO's of our commercial company's are not suited for Combat. We should have at least few New Ships with BIGGER capacity for 100s of Troops and dozens on Trucks/Tanks to fit-in. Our AFP is in badly need of this New SSV to be use for years to come. Basa-basa muna po tayo Sir ng mga articles bago tayo mg komento ng NEGATIBO sa sariling bansa natin. Excuse me Sir, upgrading our old LST's are too expensive and not feasible since these are WW2 era's pa. Having these SSV's in the future will be very useful in terms of Troops & Tank transport, SAR, etc. and this ship can move troops in any areas of our Country without the need of PIER's unlike Commercial RORO's which needs Piers to unload/upload its Cargo, Passenger, etc. And come to think of it that not all our Islands have Piers which can accommodate Vessels like this SSV. Our AFP is in badly need of this assets, and thanks to our Gov't. Officials who are dedicated to Modernize our AFP. So, please read or research first before making any NEGATIVE comment on your OWN COUNTRY. FYI, i'm not a member of our AFP neither Gov't Emps. I'm just an ORDINARY FILIPINO, a big-fan of AFP and PRO-MODERNIZATION. Please be thankful that we have such Gov't that prioritize to procure such kind on Assets. hindi ko ala m kung san mo binase yang mga sinabi mo pero malinaw na wala kang alam sa military doctrines at application nito. magresearch po muna tungkol sa merits ng purchase hindi puro dada. nagmamagaling ka pa sa mga end users eh. The WW2 LSTs that the PN has are to be used for as long as it can, but it can't be modernized or upgraded anymore. They are already past their design lifespan by several decades and should have been replaced 30 years ago. RoRo's are made for specific civilian purposes, and can't be used by the PN for their requirements. RoRo's can only do simple transporting of people and vehicles from 1 prepared port to another, and that's it. LPD/SSV are designed to meet military requirements and specifications, thus the extra cost. There's also other reasons why the PN did not order new-build LSTs, and instead went for the more complicated, more advanced LPD design. To my own opinion, It would be better that Sir Max blog here will be the pillar of his updates...considering that the presentation here are more in a professional. It seems that on his FB page...on my own ovservation it was already plague by some nonsense comments by some of our rude Kababayan. Correct me if I am wrong Sir Max. i guess it would be good if sir max revive his fb page so we could discuss there some minor, off-topic and non-military modernization issues. His fb page could give us updates on some of these topics which can"t be discussed in his blog. coz" not all the time sir max could make a blog about these issues. there he could just share a link to us than doing some blog. but, heck, that"s just my opinion. sori 4 off topic. MaxDefense was on FB before to extend the arm of MaxDefense blogs to more readers, especially that it was operating at an early stage. But I am not capable of being full time on FB due to personal and work related issues, so I decided to put it down temporarily until further notice. You can raise your concerns here at MaxDefense blogs, and let's try to limit the discussion according to the topic. so look like even Indonesia has overtaken PHL even in the defense industries. Nothing wrong with this except that I thought PHL is one of leading producers of commercial ships. and this is due to our corrupt and inept culture and government. Overtaken means PHL once in front of Indonesia, which is nonsense. The CN-235 first flight was back in 1983 while the production of Indonesian Fast Patrol Boats have been also done for decades. I never heard any PHL Products whatsoever, even small arms imported, so get your fact not fiction. not that indonesia overtaken us. it's just that our local shpbuilders' designs were not qualified or just some of them didn't participated or joined the bid.. Although a couple Philippine shipyards showed interest, none actually submitted a bid. Perhaps they are too busy with other orders or perhaps since they don't have a design ready, they don't think they can do it within the allotted time. We don't know. There's no point in feeling competitive with Indonesia. I understand the emotion since it's a basic human emotion, but rationally Indonesia is not who the Philippine should feel competitive against. Philippine and Indonesia have been working with each other since both countries' independence. Instead of feeling competitive against Indonesia, let's focus on what other capability gap that Philippine shipyards can fill. How about them LST and LCU? BRP Tagbanua is Philippine-made, so unlike the SSV project where Philippine shipyards have no ready blueprint, for LCU there is a proven blueprint. Philippine has money, even with the planned acquisition of frigates and SSV and everything. It's just a lot of the money is funneled away into popular but not necessarily useful programs (PDAF comes to mind). Since PDAF has been found unconstitutional, I hope in the future the money can be allocated into the modernization program. Hi sir Mat! Thanks for your very informative blogs. Can you also post about FA-50 LIFT? I've heard that the deal with KAI will be closed this first quarter of the year. 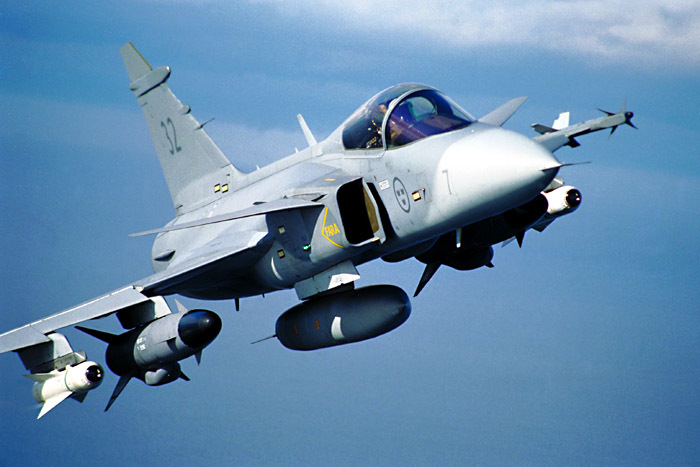 ....and also its comparison with Kfir and the issues behind why is that our government proceeds with FA-50 and not with the more capable combat-tested Kfir. Thank you. im more concerned on the frigates. a filipino should start a defense company now in partnership with the govt. why would the chinese businessmen help? we're slowly being eaten. 98% of the population dont know anything. and does this ship have CIWS? the russian ships look formidable. even u.s. and uk are making there own version. Kbyang roro!ang kinakarga sa roro mga truck at kotse 2lad ng truck ng san mguel n iniinum m hbng ngkukumento k dto sa max dpens.may tama k yta or lasing k lng!.yn dn nkuha m kakapanuod ky boy abunda.whahaha.bopols k na nagmamagaling! China has no strong reason to claim the WPS, the Spratlys, and all other outlying islands, more so to claim the Philippines. They won't have any reason to claim the so-called Deuterium deposits on the East Philippine Sea area. That assistance for Yolanda victims was a political gesture and show-off of their new found power, nothing more. No offense to the countries that help in the Yolanda/Haiyan disaster and I expressed my gratitude to them but some of the countries that help will surely take advantage for the help they provided like they going to push for PH to buy military equipment from them etc. Sir gerry, Maxdefense is not the AFP nor sir max is the secretary of national defense. At kelan pa nag spy ang china sa FACEBOOK!? China spies on everything nowadays, even on WeChat. I agree to you Sir Max, Lately China develop its own Antivirus softwares and it includes computer system optimizers guise as free softwares you can download it anywere online....but beware they may be able to invade your personal files in a stealthy way. Priscilla Chan-Zuckerberg is a 2nd generation child of Viet Hoa (Vietnamese of Chinese descent simiilar to our own Chinoys) immigrants. Saying she's Chinese is like saying her husband is Israeli. Well if someone here using Baidu search engine...please stop doing it at pati kingsoft office. most of these companies pinondohan ng gobyerno ng China. All u guys wrong. . .Banjarmasin Class no banjarsamin right!!! Guys look at this news..
Looks like we'll having jets!! yay!! Nice!! A small step is better than none... GO! AFP! thanks to china, pls continue the bullying so the modernization will reach its goals. and Missile Launch System(LOT 2). Interesting, Will this be an MPAC or a Missile Boat? Sir Max, will this be your next topic,? This is just an MPAC with a missile capability. I'll explain soon. Another FFBNW platform, IMO. There is a Lot 2 for the weapon system and launcher. So it is going to be an armed boat when delivered to the navy. But which type of missile? My guess is it is small, light missiles, enough to scare away the Chinese fishing vessels, but NOT the Chinese naval ships or even the Chinese coast guard ships. Maybe these 3 MPACs are just experimental vessels, I hope the next batch of MPACs have bigger, more lethal anti-ship missiles like exocet or harpoon. Sir max, ano pong opinion niyo sa aw159? It is a good ASW helicopter. But I prefer the MH-60R. sir Max di kaba mag a up date ng FA-50? In due time. Probably next week. I just read in Philstar that Pres Aquino has approved the payment structure for the FA-50 and the first delivery will in July 2015. Thanks very much to Pnoy and China threat. lol. sir max, kelan po ba matatapos yung stage 2 ng CUP at kelan magsisimula yung stage 3? Is it true that Sir Max has been hired as DND consultant for big ticket procurements? off topic. guys, Gen. Nick is trolling again in some military fb page. 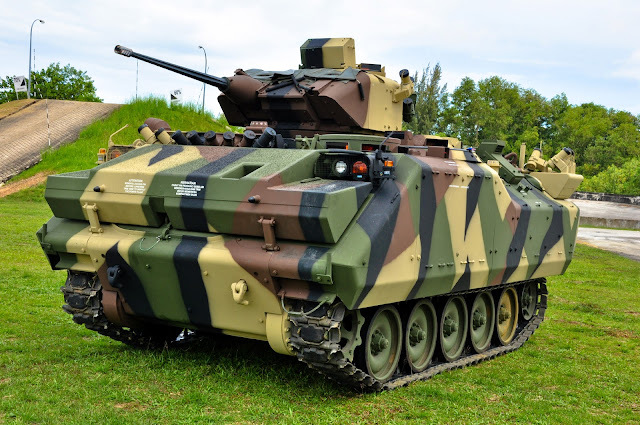 this time saying that pinoys always craves for military equipments that we can't afford. i had some argument with him. If I were you, just ignore him. Don't to him with insult because the other nations looks bad at us. Max, here's your comment somewhere above: "There's also other reasons why the PN did not order new-build LSTs, and instead went for the more complicated, more advanced LPD design." I think PN still needs LSTs. Brand new and modern one that is. The reason is LPD needs a developed port or pier for it to dock and do the loading. Are all of our islands equipped to welcome our LPDs? LPD can do the loading by amphibious means, but what are the capacity of the landing craft? How many times does the landing craft needs to go back and forth from beach to ship? I'm not saying we don't need LPD. We need them. 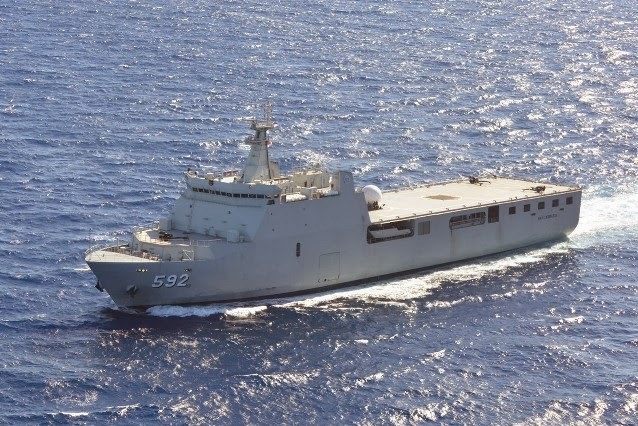 But what intrigues me is that in 2013 the Indonesian Navy signed a contract with PAL for 2 newly designed LSTs. The total requirement is around 6-8 of these ships. And yet, Indonesia already has and can produce LPDs. They say that their new LST is not the ones that we see from WWII or from Korean Wars. This LST is specifically designed for archipelago sea conditions and to transport bigger, heavier, more modern military equipments beach to beach. It is also said to have a helipad and hangar for two birds, and provisions for heavy armaments like SSM or SAM. Is it really true that the LST concept is outdated like many people say? Coz if that is, then the state of mind of the Indonesia Navy far sorrier than people think. But it's very hard for me to believe that. MaxDefense is supportive of a new LST project. But it would be dependent on what the PN can afford. With the current equipment plan, the PN will need additional LCU and even LSV which acts in a similar way as LSTs. Thanks for the details. Many people in several forums say LST is outdated is because they see the navies from developed countries are abandoning the concept, and when they see a navy still adopting the LST concept, they laughed. You're right and there's no 63-tonnes MBT that can swim from LPD to shore. 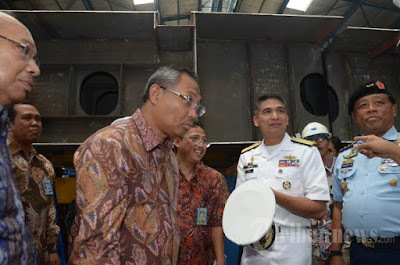 They argue that LCAC can do the job to transfer MBTs to shore, but that would require American type LPDs which are way larger than Makassar/Banjarmasin class and I don't think those large LPDs can manuver in tight sea lanes of the archipelago. Large LPDs needs to carry both MBTs and LCACs. That's why I think LST concept is still relevant for a few geographically unique countries. But of course, first thing's first, it's LPD for PN. PN knows what's best for the country. Bravo! May I ask if there are any progress update as to the construction schedule for these ships? Hi Max, are we negotiating for a third Hamilton or is that dead in the water? Thanks. We always talk about equipment and technical issue. May I ask some off the topic issue. Eventhough we have modern or new equipment did our AFP thought about improving our training and support to our troops in the field? The AFP is planning to purchase more than one type of equipment, for instance a helicopter the AFP purchase Sukol, AW109 in the long run have the AFP thought about logistic, parts, training etc...Fewer type with different variant will be more practical than buying more than one type. In our recent conflict in Zambo, I have notice our troops are not well equipped, not well supplied, not well supported with daily ration like food and water. Will this issue be part of Modernization Program of the AFP? As a veteran, psychologically a soldier away from his/her family, down range, a well ration food and water will help a soldier perform his/her duty better. Is it true that DND specs of SVV could accommodate 2 10 tons helicopter hangar? She looks beautiful! But look like bow heavy, hope thdesign works. Sir Max, upon the delivery of the said vessel, is it armed already or to be armed here in PH?